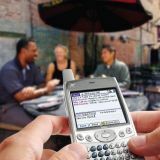 Solutions At Hand provides training and consulting services for Palm Powered® handhelds and smartphones. We’re based in Ottawa, Canada, and we proudly serve the National Capital region. We will offer our clients focused training and personalized solutions to ensure that their handheld computer makes their lives more productive, enjoyable, and stress-free. Who are our clients? Real people, just like you. We know everyone’s needs are different, and that one size doesn’t fit all. Our clients are individuals from every walk of life; anyone who wishes to improve their quality of life through better organization and the use of a life management tool. We can work with you one-on-one to find the best solution to meet your needs. Our clients are also businesses from every sector. We’re very familiar with the needs of business and government, and we can help you integrate handheld computing into your business environment, from the data centre out to the individuals who will use those services.